What do I know of India? Only that I love the Indian students who have been in my class: Akhil, Dhiti, Sanjay, Amritha, and Saani come first to mind. That I love Indian food such as samosas, tandoori chicken, naan and that wonderful mango ice the name of which I don’t even know. That books by Indian authors, such as The God of Small Things (which won the Booker prize in 1997), strike a chord in me that resonates deeply. 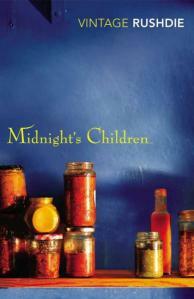 That is why I had to read Salman Rushdie’s Midnight’s Children. The Booker of the Bookers? Read with friends? It was an opportunity not to be passed up. Our hero begins by telling of his grandfather’s life, how Aadam Aziz was called as a doctor to see what was ailing a landowner’s daughter. When he arrives he discovers two women holding up a sheet with a hole cut out of the middle. It is through this hole that he is allowed to examine Naseem. One part at a time for each of the many he visits he makes. Eventually, they fall in love and marry. But, is there a more eloquent way of describing how it is that when we marry we never see the whole person? We see only the fragments, separated from the entirety, and these pieces when standing alone are often easier to love than when they are all assembled together into the person we realize we have married. Aadam and Naseem have three daughters: Alia, Mumtaz and Emerald. It is Mumtaz, renamed Amina by her husband, who becomes pregnant with our hero. She awaits the birth with anxiety, as she is told by the fortune teller to whom she is brought, that “There will be a nose and knees: knees and a nose.” As if not knowing all that one is carrying is not cause for anxiety in itself. There’s so much I’m glossing over here, so many parts of the story. But if I told them all I would deny you the pleasure of discovering them for yourself, and so I will go on to Rushdie’s style. His writing portrays images as clearly if I was watching them on film, telling what happened while at the same time wrapping it in a bit of the fantastic. However, I found his elements of ‘magicial realism’ to be more real than not. For example, he tells of Naseem’s ability to visit her daughters’ dreams. What was it the spittoon-hitters said about Naseem Aziz? ‘She eavesdropped on her daughters’ dreams, just to know what they were up to.’ Yes, there’s no other explanation, stranger things have been known to happen in this country of ours, just pick up any newspaper and see the daily titbits recounting miracles in this village or that – Reverend Mother began to dream her daughters’ dreams. It makes perfect sense to me, that analogy of ‘visiting her daughters’ dreams’ with a mother’s intuition. I know that my own mother is also capable of such a feat (whereas I have not had quite the same skill with my son). Or, how about the way that some women swallow their feelings? Because certain things are not to be said, these things fester inside so deeply that they still become apparent to anyone who is looking. Reverend Mother was forced to dig deep into her pantry, which thickened her rage like heat under a sauce. Hairs began to grow out of the moles on her face. Mumtaz noticed with concern that her mother was swelling, month by month. The unspoken words inside her were blowing her up…Mumtaz had the impression that her mother’s skin was becoming dangerously stretched. Near the conclusion of Book One, Earl Mountbatten of Burma has announced the Partition of India. It is August, 1947, and Naseem’s world is about to change. As is that for all of India with the pangs of birth. And there was a sheet in a gloomy room. On that day, my inheritance began to form – the blue of Kashmiri sky which dripped into my grandfather’s eyes; the long sufferings of my great-grandmother which would become the forbearance of my own mother and the late steeliness of Naseem Aziz; my great-grandfather’s gift of conversing with birds which would descend through meandering bloodlines into the veins of my sister the Brass Monkey; the conflict between grandpaternal scepticism and grandmaternal credulity; and above all the ghostly essence of that perforated sheet, which doomed my mother to learn to love a man in segments, and which condemned me to see my own life – its meanings, its structures – in fragments also; so that by the time I understood it, it was far too late. I’m eager to continue with Book Two, the first half of which will be discussed on April 30. There is much to be revealed, and what a revelation it is through Rushdie’s eyes. I'm so glad you like it! Look forward to your next Book 2 review. 🙂 I particularly like the story of Aadam Aziz and Naseem's courtship stories and Protagonist's early childhood memories. Nice recap of Book One, Bellezza. You mentioned that “His writing portrays images as clearly if I was watching them on film…” how true, his writing is animated and fascinating. Now we can see it actually on screen comes this fall (links to that at end of my post). Rushdie is involved in the screenplay. But of course, book and film are very different media and art forms. Still, we hope the film won't disappoint. Thanks for participating in the Read-Along! I'm loving this book so much. The writing is so rich, I don't think I've ever read anything quite like it. I'm looking forward to reading the rest of the book. I've been entertaining similar lines of thought this week. For example, in class, Thursday, I talked of how we can never see the whole person (in or outside of marriage) nor understand their whole world or story — and that this reality makes us like tourists traveling in one another's world. It's interesting how certain themes or lines of thought appear only to reappear a short time later. Repetition makes me pay attention. I liked the passages that you shared especially the one about the invasion of dreams and loving a person in fragments. There definitely is much to be revealed in the next book (I had read a little ahead). I also had to gloss over much in my summary – I really only gave a sketch – I couldn't hope to cover everything that was going on there!